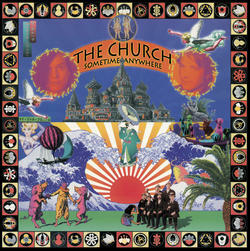 (2-LP set) The 1994 release by The Church "Sometime Anywhere" found the group down to two original members, bassist/singer Steve Kilbey and guitarist Marty Willson-Piper, after the departure of Peter Koppes. The resulting album featured new song writing approaches and musical experimentation resulting in many lengthy, lush tracks (Day Of The Dead, Two Places At Once, Fly Home). Song structures are much freer with an early electronica sound dotting the textured arrangements with loops and drum machines featured on some of the songs. "Sometime Anywhere" is another dark, epic, and exotic masterpiece by the Aussie legends that propelled the band into the next phase of their career. Reissued on blue & orange vinyl from Plain Recordings.